Having read several narratives of Roentgen's glowing cardboard screen and the mysterious Crooke's tube, I have always found myself fascinated to Radiology. I often wondered what do radiologists do in their secretly tucked dark rooms and how those digital blueprints and monochrome scans make sense. The transition of radiology from giant X-ray tubes to present day dynamic scans and angio seals, prompted me to consider a career in radiology. And such was my taster week experience that my interest has now transformed to a drive to become a radiologist. I am an international medical graduate doing my Foundation Year 2 Clinical Fellowship. Although I had done a 2 weeks elective in radiology during my internship in India, I was keen on doing a taster week before entering specialty training in the UK. A taster week can be a great opportunity to give a useful insight into a specialty and connect to trainees and consultants who are currently working in that field. I arranged my taster week by emailing a radiology consultant in my hospital who was kindly accepted and set things up for me promptly. After a quick discussion with the radiology consultant, I emailed my rota manager who was very generous to grant me study leaves for a week. My week was spread between plain film, USS, CT, MRI and some IR sessions. While the plain film sessions were quite useful to carry on to my regular job, the IR experience in the theatre was quite thrilling. Interventional radiologists are clinicians with those magic wands (catheters) who practice some sort of futuristic medicine. It was an absolutely stirring experience for me. Spending a week in radiology gave me a lot of clarity on my doubts and misconceptions about the specialty. AI won't replace radiologists: Every time I had expressed my interest in radiology, I was told that it will soon be replaced by AI and radiologists will be left with no jobs. My experience tells me that AI will only alter the job of a radiologist and not replace it. Radiologists do more than reading and interpret images. They recreate the patient's clinical story when they look at a scan. AI can recognize but never interpret an image. Radiology is a core clinical specialty: I was disillusioned that radiology is only technical and has a slight clinical edge to it. During one of my initial sessions during the week I mentioned the same to a radiology consultant and funnily but legitimately he got quite upset and told me there's a reason it's called 'Clinical Radiology'. A week into radiology, I realize that there is in-depth clinical processing in radiology with every scan. Radiologists touch the lives of their patients every day: It might be true that radiologists see fewer patients than an average clinician but with every scan interpretation a radiologist is affecting the life of a patient. They add value by not only interpreting the scans but also consulting with other physicians on diagnosis and treatment, treating diseases with local ablative therapies and relating findings clinically and from lab tests. More recognition within the healthcare system: I attended a surgical and respiratory Multi-disciplinary Team Meeting (MDT) during the week. I realized that the traditional view of the radiologist as a physician who sits in the dark rooms defining technical parameters of imaging procedures and interpreting diagnostic images is now outdated. Radiologists have now come to the forefront with multi-disciplinary meetings where they are valued and recognized for their opinion in deciding the course of treatment for patients. 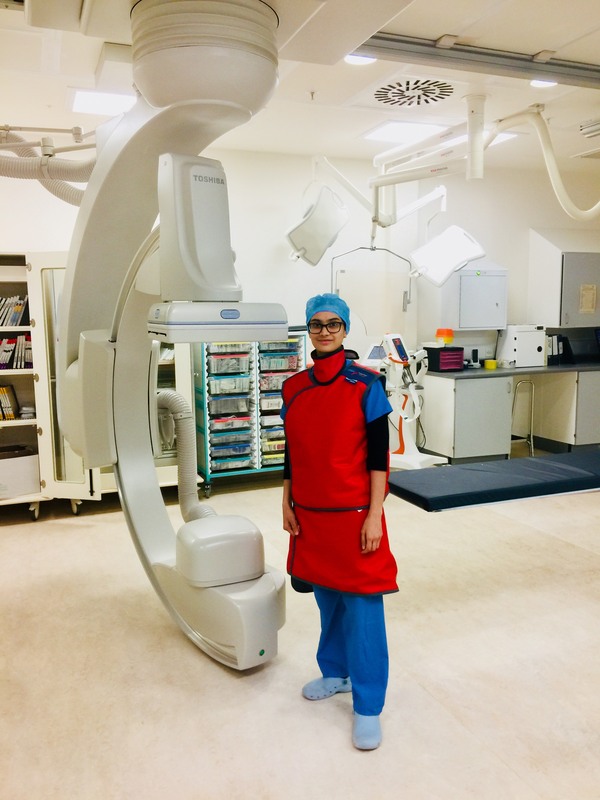 Radiologists are happy people: Having rotated through various departments during my internship (the Indian equivalent of FY1) and experiencing a few departments in the NHS, I found a striking difference in how radiologists see their work. They work as a team, care for each other and are very encouraging. Don't be surprised if your fellow consultant is making you a cup of coffee! Also, the trainees usually support medical students and junior doctor in finding a road to enter specialty training. Overall, I felt that the happiness index of radiologists was higher. In summary, I thoroughly enjoyed my taster week and am pleased with my experience. For a radiologist, no two days are the same.There is immense learning and fun in radiology. I am already dreaming of holding the needles and being on the dictaphone. I would recommend other foundation doctors to undertake a taster week too. I have come out more aware and orientated to work on radiology audits and academic projects. I would like to add a special note of thanks to Dr. Amit Patel, Consultant Radiologist, Queen Elizabeth University Hospitals, Glasgow, who kindly accepted me as a taster week student and scheduled my sessions. Deepsha Agrawal, FY2 Clinical Fellow, Neurosurgery, Queen Elizabeth University Hospitals, Glasgow.